Eldon, Missouri, a central Missouri community of 4600 on the proposed 144-mile extension of the Rock Island Trail, has adopted a Complete Streets Resolution, becoming the 35th community in Missouri to adopt a Complete Streets policy of some kind. Find out more about Complete Streets in Missouri, and how your community can adopt a Complete Streets Policy here. The new policy in Eldon adds another rural Missouri community to the list of Complete Streets cities in the state--a trend in recent years, as cities like Warsaw, Pineville, Anderson, Caruthersville, and Southwest City have recently adopted Complete Streets policies. Eldon is the third Complete Streets Policy in a the Rock Island Trail community--and the first new Complete Streets policy on the 144-mile section of the Rock Island Trail that is currently under consideration for transfer to Missouri State Parks. Other Rock Island Trail communities with Complete Streets policies include Lee's Summit and Kansas City. Jefferson City and Warsaw--which both have plans to connect to the nearby Rock Island Trail once it is complete--have also adopted Complete Streets policies recently. In Missouri, more than 2.7 million citizens now live in a municipality with a Complete Streets policy. And 3.2 million Missourians--more than half the state's population--live in a Metropolitan Planning Organization (MPO) that has adopted a Complete Streets policy. Most of Missouri's largest cities--including St. Louis, Kansas City, Springfield, Columbia, St Joseph, and Jefferson City--have adopted Complete Streets policies. In recent years, the momentum for Complete Streets in Missouri has moved more to suburbs and rural communities, where much work remains to be done. Why are Complete Streets Policies important for rural Missouri Communities? “Poverty is a big issue here. We really don’t have public transportation… so, it makes it difficult for people who don’t have transportation,” said Behm. “What they are having to do is rely on other people to get to and from where they need to go. But if they need [a ride] or [are] relying on [others] to get to work, that is a real issue. If you don’t get to work on time, you loose your job, and that just keeps you in poverty.” . . .
[A]ccording to the American Community Survey, McDonald County has a 19.3 percent disabilities rate. Behm made it clear that allowing for others, not just motorists to use the road is very important. She talked about a man in a wheelchair she regularly sees who motivates her. Download Eldon's new Complete Streets Resolution here (PDF format)--Eldon's Resolution is an excellent starting point for anyone who wants to take Complete Streets to their city council or mayor. 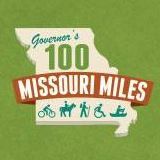 Working for Complete Streets policies in Missouri has been a major area of emphasis in MoBikeFed's Vision for Bicycling and Walking in Missouri. Since 2001, Missouri has gone from zero to 35 Complete Streets policies--amazing progress in a very short period of time. Your ongoing membership and generous financial support helps turn our Vision into reality! Did you know you can become a Sustaining Member of MoBikeFed by making regular monthly donations, starting at just $5 month? Find out more here.